In a just released report, MGI Research announced that they increased their MGI 360 rating of Zuora in the Billing Management market from 61 to 62 and reiterated a POSITIVE outlook. The recent upgrade of Zuora’s MGI 360 Rating currently places it as #1 amongst cloud-based agile billing solutions. – Over the last 12-18 months Zuora has shown a steady improvement in execution, sales focus, and R&D discipline together with stronger cost controls and better customer feedback. – Investment into microservices architecture is allowing for more modular packaging and faster time-to-market. – Zuora is adding lightweight modules for CPQ and a Payment Management component that also provides expanded Collections capability. – Acquisition of revenue recognition specialist Leeyo added an important product (RevPro – not rated here) that is currently in the sweet spot of customer demand together with skilled talent and an attractive client base. In summary, the MGI 360 update asserts that, in their view, Zuora has significant headroom for further growth. Each of these key criteria is subdivided into numerous sub-categories. 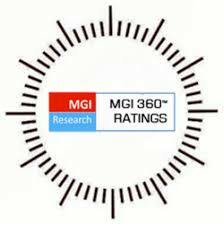 In total, over 125 criteria are combined to generate an MGI 360 rating in each specific market space. View the MGI 360 rating update on Zuora. MGI Research is an independent industry research and advisory firm focused on disruptive trends in the technology industry. Through subscription research, advisory engagements, industry studies and ratings, MGI Research helps clients identify opportunities for reducing IT costs and minimize technology risks.